KAMPALA – Former army commander Maj. Gen. Mugisha Muntu, has warned the country’s military personnel from being used to harass and met injustice to the population over political differences. In a statement issued directly to the military on Tuesday, the retired general of the Uganda People’s Defence Forces (UPDF) urged those in military uniform to honour their oath and do the right things following machinations in which some have been used against the civilian population in the aftermath of the arrest of MPs Robert Kyagulanyi, Francis Zaake and 32 others after poll violence in Arua. 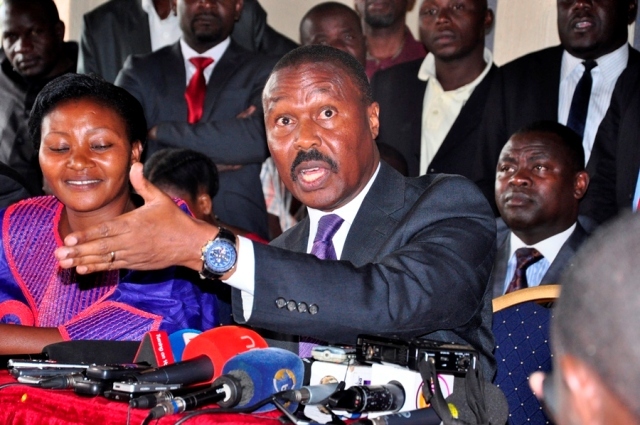 “While we continue to pursue all possible means to free Bobi Wine, I would like to urge the men and women in uniform to choose right over might and desist from being used as pawns in the unjust and highhanded torture of Ugandans,” Gen. Muntu said. Over the past several days, we have seen an escalation in the violent confrontation of civilians by security forces. Our sources have also confirmed to us that there are on-going efforts to pressure police officers in Arua to testify that they found our colleague, Hon. Robert Kyagulanyi with arms, contrary to their sworn duty to effect justice and truth. Your sole purpose in the army and police is to serve the people. It is to them, and not any government, past or present, that all power belongs. As one that has served under authority, I know what it means to be faced with a choice between obeying an order from above and doing the right thing. I know what it means to be caught between serving your Commander-in-Chief and serving those that choose your Commander-in-Chief. It is hard to choose to do the right thing, especially when such noble action would likely be rewarded with harsh treatment and doing the wrong thing holds the promise of state protection. But you need to remember this; before you wore that uniform, you wore with honour the badge of citizenship. And it is that badge that you will retire to sooner or later. You had better make decisions in uniform that will ensure your safety when you are out of it. If you choose today, to side with those oppressing the people, you will not only have failed in your duty to serve and protect, but you will also have thrown away your conscience as a citizen. The people giving you unlawful orders are no more human than you are. And sooner or later, you will be a civilian, just like the people you are being asked to torment and treat unjustly. The people of Uganda recognise the work that you do to keep the country stable and safe. We recognise your sacrifices for the sake of peace. Both home and abroad, you have served humanity with distinction, helping stabilize the region and ensure law and order are kept at home. It is not you that the people of Uganda have an issue with. As Hon. Kyagulanyi quite rightly put it, ‘we are not fighting you, we are fighting for you’. I have said I know how hard it is to be in the position you are in today. But I also know how satisfying it is to choose right over wrong. There is nothing more rewarding, nothing more fulfilling, than leaving the army and finding that you do not need a gun in your shoulders to live peacefully with your neighbours. As you go about your duties, ask yourselves the same question I have asked fellow servicemen over the years; if you will break the law to protect those in power against the law, what makes you think you will have the protection of the law when those in power leave? And they will one day leave, just as surely as the sun rises and sets. I urge you to choose right over might.